Akmenos is the disappointment of his hatching, with no sorcery or battle skills to make his parents proud. The son of Bane, head of the Emperor’s sorcerous Hornung Coven, is a cook in the castle kitchens, a role suiting his aptitudes and interests. Dropped suddenly into deep political machinations and named as a Prince’s murderer, Akmenos flees, with only the tools of his trade, and few supplies. What follows in Dan Rabarts’ Brothers of the Knife is unstoppable adventure for this unlikely hero, who really just wants a good cup of tea and for life to return to normal. While the novel on the whole is light-hearted, there’s a few pointed looks at privilege, and the unseen benefits of being part of a ruling class. Akmenos is always quipping, but gets on with trying to do good on his journey. It has the punny heart of a Pratchett book, and misses no steps in a rollicking good adventure. There is some detailed world building, which is the hardest part of writing novels in a fantasy world. Dan has kept this to a minimum but the narrative calls for multiple explorations of the realm. The pace kept the reader from exploring too deeply, and I wonder if those parts of the world will feature more heavily in later books. It’s a refreshing change in fantasy to have a character who just is, not black and white, not a soldier or a savant, and not predestined for greatness. Akmenos is an any man, with a nose for the finer flavours of life. 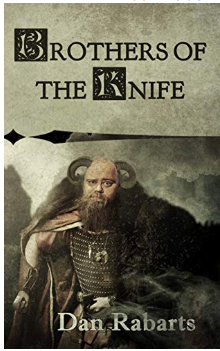 Brothers of the Knife is Dan Rabart’s first solo novel in the Children of Bane series, and recommended for adult to mature young adult readers. Dan also has an impressive back catalogue of fiction if you’re intrigued, which you can find out more about at dan.rabarts.com.